Home glowing skin SKINCARE I look like I have on foundation but I don't! How was your weekend? Ughhh I'm so tired. My BF's good friend and girlfriend came into town to visit and we went out with them last night and Saturday night. I don't usually go out the night before work so i'm pooped! I have a doctor's appointment today for my allergies and asthma I've been suffering from the last few weeks so at least I won't be at work all day. Meanwhile, on to the post! 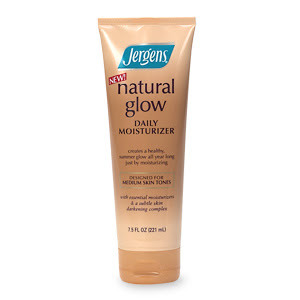 I wanted to share with you the secret to my golden glow...Jergens Natural Glow Express. I pick this up at my local Kroger (a grocery store for those not familiar) for around $7. I've been a fan of this ever since I read this review on Beauty Logic's Blog last year! As a Filipina raised in Florida, I've been pretty tan all my life. I love the way that bronzed skin looks - healthy, glowy and slimming at the same time! However, once winter hits I get pretty pale and really yellow...especially in the areas not exposed to the sun like my legs and torso. Up until a year or two ago I would have no problem laying out with my tanning oil or even popping into a tanning salon to get my bronzed look up and running. However, having a beauty blog definitely changes things! After educating myself about my skin, I'm totally an advocate of skincare prevention and avoiding sun damage. There's nothing wrong with enjoying the sun, but sunscreen is necessary and overexposure is just bad. Now that I'm 25, I've got to really prevent skin damage...and they say most premature wrinkles are a result of sun damage. 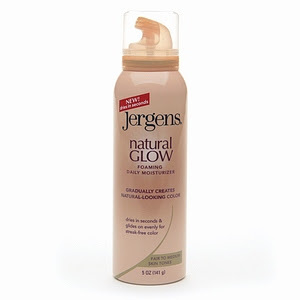 For the first time last year I tried the Jergens Natural Glow Line. I first tried the regular version - Natural Glow Daily Moisturizer, which is supposed to enhance your natural tan after about two weeks. Honestly, that did nothing for me. I'm slightly tan already so I was disappointed at the results. However, I was too embarassed to run out and get the regular self-tanning lotions. To me they had a stigma of leaving Caucasian women orange and yucky...and as a minority I was embarassed to try it. (I didn't mean to offend anyone with this last statement - Just my honest opinion). However after reading Beauty Logic's post, I was amazed that this beautiful Dominicana was using a product to keep her bronzey glow. The product was available at my local grocery store and was very reasonably priced. Why not give it a go? I chose the medium/tan color. The smell isn't overpowering like other tanners...it's mild and fades away. The key is to exfoliate your skin with some sort of scrub first (so that the lotion applys evenly and doesn't stick to dry patches) and then apply the lotion to damp skin. Apply it like regular lotion, blending it in to all areas of your body well. Then wash your hands and watch the magic happen. After one use I looked like I had laid out for an entire day. It wasn't orange like I feared...instead my skin glowed and was just bronzey beautiful. It's recommended to use 3 days in a row. After 3 days I looked like I had come back from a week long tropical vacation. I'd probably use this once every couple of days to keep up the glow. I turned my over tanning friend onto this and she loves it too! Say goodbye to sunburn, wrinkles and heat exhaustion from laying in the sun! About a week and some change ago I picked up the Daily Foam Facial Moisturizer that goes with this line. I applied it for the first time yesterday after I had exfoliated my skin. The foamy texture made it really easy to blend it into my skin. Plus, no weird allergic reactions or hives, yay! I gave it time to dry. I'm not kidding you, a few hours later I looked in the mirror and I thought "When Did I put On Makeup? "...then I realized it was the moisturizer! It looked like I had the perfect skin look of wearing foundation. My redness and discoloration was replaced with even, glowing skin! Can you tell I love this stuff? You can pick up both products at any drug store or target/wal-mart for under $20. Now that the weather is warming up, this is the perfect tool to get you out in those short shorts and tube tops. aww Ren ren! I wish you get well soon!!!! Thanks for sharing the "glow"
that stuff sounds really good! are you able to post up a pic of what it looks like on the skin please? thanks. my sis-in-law is really fair & she just bought this. She looks great. I'm goin to try it out.Plz do take a pic!! i'm gonna give these a try. thanks Ren Ren!! Thanks for the review. You've been using these products? No wonder your skin looks so dewy and beautiful. I have the Jergen moisturizer too but never used it. The daily foam moisturizer sounds good. I will check it out the next time I'm at a drugstore. If you can, take some pics of the moisturizer in work [as foundation]. man!i already bought the regular jergens about a week ago (maybe i can find the receipt!).. not the express =( can't wait to try the facial moisturizer! lol i've always wanted to tan and get that brozed look but ya im sorta tanned already so i know what u mean by being embareassed! lol no shame love! I agree with you about turing yellow in the winter! There are only two alternatives: using whitening/brightening serums, or using fake tan! Another really good fake tan for face is Clarins, and it has SPF15. You can use it as tanner and moisturizer too. This winter, I went the whitening/brightening route with P&J Whitening Serum...it really helped to get rid of the sallow tones! i think i might try the second one, the foaming product. thanks for this review! i was actually thinking of picking this up at wal-mart the other day but they were sold out! thanks ren!